PAT Perspective are a specialist PAT Testing Company providing reliable, professional and competitive PAT Testing across the South. We carry out PAT Testing in many types of environments such as offices, shops, schools, holiday parks, hospitals, pubs, rental properties & construction sites. We serve customers right across the South from London to Bristol, including Hampshire, Surrey, Sussex, Wiltshire, Berkshire, Dorset, Somerset, Devon and Cornwall. Our test engineers located across the South are fully qualified, fully insured, DBS Checked and follow the IEE Code of Practice for Electrical Testing. Our engineers work quickly and quietly to ensure minimal disruption to your staff and customers. We provide individual quotations for specific environments, we work to a sensible and sustainable tariff ensuring we can deliver genuine value for money. PAT Perspective Limited have been independently assessed by the ECA (Electrical Contractors Association) for our quality of work and business systems. We are registered members and approved for PAT Testing & Electrical Work. We are also Safe Contractor Approved. Our quality assurance team along with the ECA regularly audit our engineers to ensure the highest levels of testing are maintained, this means that you can be assured that all your equipment has been tested to the highest standard. PAT or PAT Testing stands for Portable Appliance Testing and is a way of complying with the multiple health and safety legislations. A qualified engineer performs a number of tests to ensure that the equipment meets the required safety standard. The correct term for the whole process is In-service Inspection and Testing of Electrical Equipment. This process applies to all types of equipment even if they are not portable. You can find out more information about PAT Testing by clicking here. 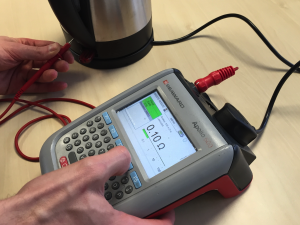 PAT Testing – Arrived and carried out the service in a professional and competent manner over a course of three days. Found Alex very easy to work with and he kept me informed where he was on the school site at all times. We searched around for the cheapest quote and for a small office like ourselves PAT Perspective were easily the cheapest. They could also organise the PAT test within the week. Our engineer Alex was very friendly and accommodating, ensuring that the PAT tests didn’t disturb any work unnecessarily. He was also very quick and efficient and the report was sent back that day. Very impressed with the engineer and the company overall, will use again next year. This is the first year that we have used PAT Perspective, I am pleased to say that we were extremely pleased with the service that The Park Federation Academy Trust received. We would have no hesitation recommending PAT Perspective to others. We had over 250 appliances tested and found PAT Perspective to be very efficient, friendly and professional and would not hesitate to use them again. 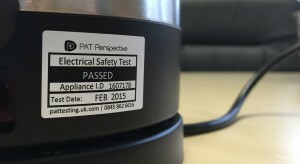 Perspective have been conducting the PAT Testing across all our stores since 2013. The team at Perspective are always prompt, reliable and thorough. No job is too much of a problem and they always do their best to help support us in our requirements. I would be happy to recommend Perspective, good job every time! Berkshire, Dorset, Somerset, Devon and Cornwall.